The decision to offer your guests a sit-down dinner or buffet is not just a matter of preference. Consider the setting of the event and who will be attending. Ultimately, presentation plays a big role in your guest’s satisfaction with their meal. If you choose one format over the other without considering all the angles, you could end up with a less than stellar review of your event. In short, the more formal the event, the more appropriate a served meal is for the occasion. If guests are expected to wear jackets, ties and evening gowns, then the expectation will be there for table service. The only exception to this rule might be weddings, as some receptions are designed to be informal. That being said, you should always think twice about asking well-dressed attendees to navigate through a buffet setting. The other major determining factor in the decision of meal formats is the size of the event. The practicality of a buffet decreases as the guest list grows. The average double-sided buffet line can serve approximately 100 guests in 30 to 40 minutes. Thus, you will need to add another line for every 100 guests that register. At some point, there will not be enough space in the room to accommodate both the buffet lines and the aisle space needed to allow sufficient traffic flow. Almost everyone would prefer to be served their food as opposed to getting it themselves. Table service allows for better conversation between guests and maintains consistent serve times for each individual. Perhaps more importantly, it eliminates wait times and the need to meander through a maze of tables and chairs while carrying plates and glasses. Overall, plated meals provide a uniform experience for everyone. 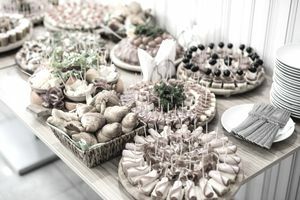 There are ways to streamline the service pattern for buffets if you want to offer your guests some of the advantages to a served meal. One option is to preset salads and desserts at each place-setting. It decreases the amount of the food that must be transported across the room, and it ensures a consistent start time for the meal since the salads will be ready at the tables. Combine this with a “captain’s call” where the servers notify each table when it is their turn to proceed through the buffet. Incorporating both of these options will make the buffet experience more efficient for your guests.